The guidelines below are meant to help you create interesting and relevant entries for the Collaborative Dictionary. You can contribute to the dictionary’s enrichment and enhance its value for users who search within it and are willing to become proficient in a language. We have tried to be as clear and complete as possible by adding many concrete examples. However , if you think that some points are missing or have been left unclear, feel free to contact us at dictionary@reverso.net and make your suggestions. There is no point in having duplicated entries in our dictionaries.So, please make sure that the entry doesn’t already exist or that you bring something new to the existing explanations/translation. If there is already a similar entry in the Collaborative Dictionary and you want to complete its meaning or translation, add details on the context of use, give examples or other info that may help the other users better understand it, we recommend you comment upon the existing entry. If your word or phrase exists in our general dictionary (Collins), but not all the meanings/translations are covered, you can use the option to suggest a new translation/definition and a new entry will be created in the Collaborative Dictionary under your name. To choose the most adequate translation, make sure that you are accurate enough. If you are adding a definition, try to use clear explanations. Keep in mind that a user who has never heard the word or expression should be able to understand what it means and when it’s used. If you are adding a translation, focus on the idiomatic equivalent of your word or expression. 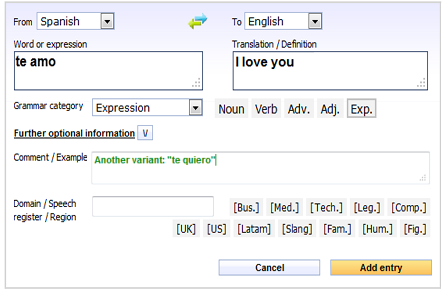 However, there are cases when a perfect match does not exist in the target language. 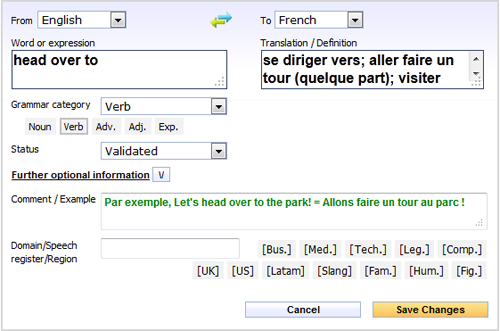 In this case, offer the closest translation(s) and additional explanations to help users understand your entry. Example 1: “petit chat” => “kitten” Here, “kitten” is over-translated, since “petit chat” means “small cat”, not necessarily “kitten”. Example 2: “tough guy” => “dur”. Here, “tough guy” is under-translated, “dur à cuire” would be more accurate than “dur”. Pay attention to idioms and language specificity. Example: “kick the bucket” literally means “hit the bucket with one’s foot”, but it also means “to die” (figurative language). 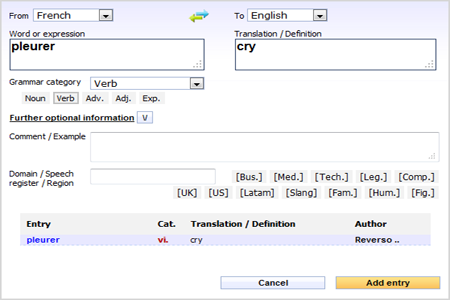 To help other users understand your entry, do not hesitate to add synonym or near-synonym translations. Separate them by a semi-colon (;). 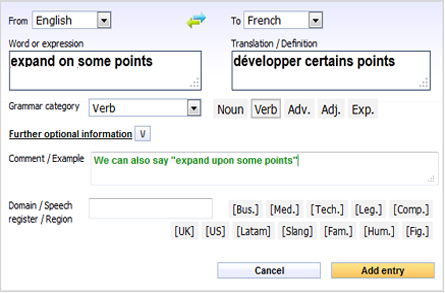 Specifying the context, the domain or the regions is important, especially if the translation changes as a result. Example in French-English: “scratcher” => 1. “scratch” [Music] 2. “crash ; break”. Here, the word “scratcher” has two different meanings. Specifying that the first one is related to music helps other users understand it more precisely. Make sure your text is typed correctly (be careful with accents, double letters, spaces between words, hyphen separated words...). 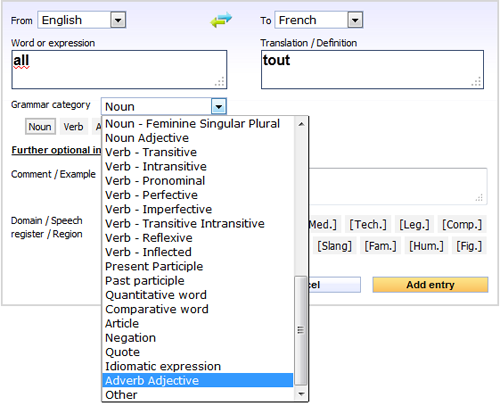 For English and French words, don’t hesitate to use our free spelling and grammar checker. Expression Any idiomatic expression that doesn’t fall under any of the previous categories I can’t take it; Come in! je n’ai rien à ajouter ¿A quién se le puede ocurrir? For verbs, use the infinitive. Don’t use gerund or other conjugated forms for stand-alone verbs! In English, don’t write “to” in front of the verbs, except the case where the verb is part of a phrase in this form (for example “get to know something”). For nouns, use generally the singular form without any articles. The noun is singular defective (it does not have a plural form). 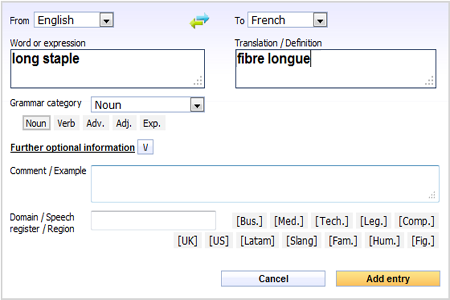 Examples: “jeans”, “glasses” in English or “funérailles”, “frais” in French. Together with the article, the noun gains a new meaning in certain contexts. Example: “the godfather”depending on the context, can have a different meaning: mafia leader, head of a criminal group. They are part of an expression, with definite/indefinite articles or in plural form. Examples: “the good and the bad”, “la Belle et la Bête”. For adjectives and nouns, you can write the masculine form and indicate the feminine form in the “Comment” field. Type in lowercase letters except if the word only exists in capital letters (proper nouns, acronyms etc.) or if it is an expression used as a stand-alone sentence. The “Source” contains the entry, in other words, the term that you want to define or translate. If it’s a phrase, you can either add the base form (infinitive verb, indefinite pronouns…) or you can choose to add an inflected form, the one that seems to you most likely to be searched by users. For instance, for the idiomatic phrase “make oneself at home”, we can also choose to add the translation/definition of “make yourself at home” inflected form, having in mind that this one is the most frequently used. Avoid writing several “items” in the “source” field. If it’s an adjective or a noun, write the masculine form in the “Source” field; you can indicate the feminine form in the “Comment” field. If there are variants that have exactly the same meaning, you can add them in the “Comment” field, as shown in the examples below. The “Target” field contains the translation or the definition of the entry. If there are several translation variants, use semi-colon to separate them. If there are several meanings, number them. Try also, as much as possible, to prioritize them, based on the frequency of use. If appropriate, you can add indications of style, meaning, register, or region between brackets just after the meaning. 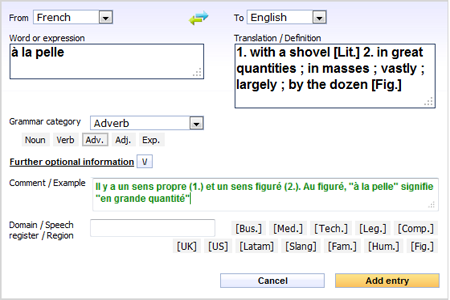 The “Comment” field is used for refinement: examples of use, opinions on suggested translations, cases. 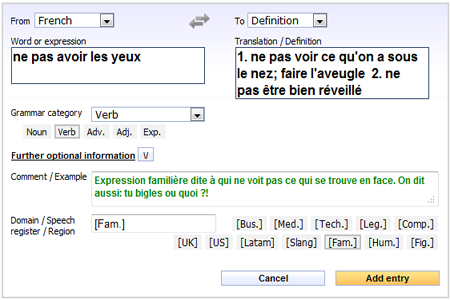 Comments help validating or completing entries and their translation/definition. Use the “Domain/Speech/Register” field to give details on the subject area, region or style the word/expression belongs to. You can either type it manually directly in the field or use the shortcut buttons on the right. The list is obviously not exhaustive, but we tried to put the most frequent items. Let’s look at examples of bad entries and highlight the problems for each one. Let’s look at examples of good entries and highlight the strengths for each one. The two meanings are numbered and the translation variants are separated by semi-colon. What is the Collaborative Dictionary for? Every day, new words are created. Some of them are brought to the forefront by the media. Others are diverted from their original meaning. Simply put, language is continuously in creation. A dictionary can hardly claim to be really exhaustive; but we think that everyone can contribute to the creation of a place where people can exchange their knowledge about words and languages that they know. The Collaborative Dictionary aims at gathering the greatest number of words and expressions from all around the world, ranging from slang expressions to very specialized jargon. To achieve it, we need your help. That’s why it is designed so that you become the author of its content. What do you find in? Translations and definitions of words and phrases in many languages, written by users: idiomatic, new, poetic, argotic, slang, specialized vocabulary. Why is the Collaborative Dictionary different from other dictionaries or forums? When looking up a definition or a translation, you expect to find an answer quickly and to not be forced to go through lines and lines of discussion. The Collaborative Dictionary gets straight to the point. It is not a forum! It is a dictionary, with headwords and related definitions or translations. It’s not a forum, but it’s collaborative. It means that we encourage not only people’s contributions but also interactions between them. If you don’t find the definition or translation you were looking for, you can ask for it by creating an entry in the Collaborative Dictionary. If people from the community have an answer, they will complete it. You can vote for their contribution and add a comment to explain your vote. Can I also add phrases to the Collaborative Dictionary? Of course! You can create an entry made of several words or you can add a phrase as long as they sound idiomatic and they correspond to what users can search for. 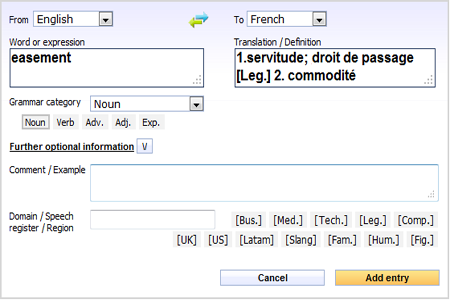 If you have other questions, do not hesitate to contact us at dictionary@reverso.net. How should I proceed when the entry has several parts of speech? For example, the term “à base de fruits” in French can be used both as an adjective and an adverb. But the translation in English will be different according to the part of speech: the adjective will be translated by “fruit-based”, whereas the adverb will simply be “with fruits”. 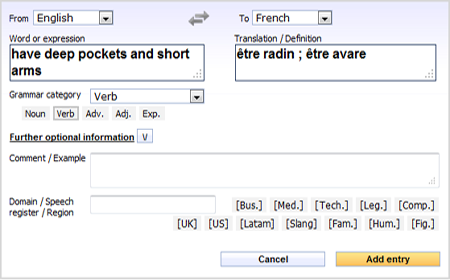 In this case, it is clearer to create two separate entries, namely one for “à base de fruits” as an adjective and the other for “à base de fruit” as an adverb. Adv. : se nourrir à base de fruits = feed oneself with fruits, have a fruit-based diet. However if the term has two grammar categories and the translation is the same in any case, you can create a single entry and pick up the corresponding compound part of speecj from the drop-down menu. For example, “all” in English is both adverb and adjective and it will be translated in French by “tout”, which is also both adverb and adjective. 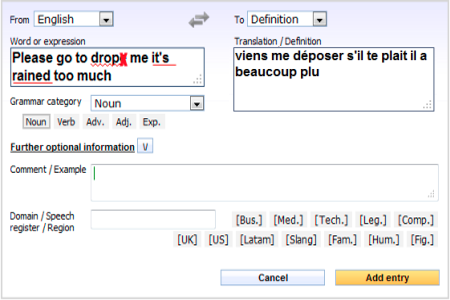 In this case you create only one entry for “all” and choose the part of speech “Adverb Adjective” in the drop-down menu. Do not hesitate to add examples for each part of speech. 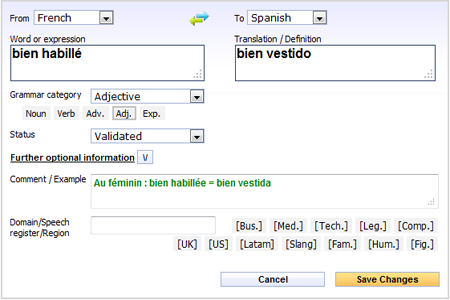 How should I proceed when the entry has different meanings and translations? Words and expressions can often be translated in several ways. When what we fill in in the translation field is just another way of saying the same thing, we recommend you to separate the various translations by a semi-colon, as shown in the example below. 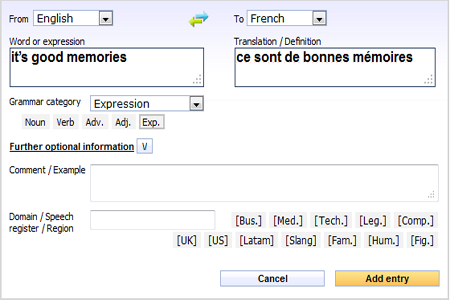 On the other hand, when the entry has multiple translations with different meanings, we prefer to number them. As shown in the example below, you can add information into brackets in order to specify the use or the context for each.